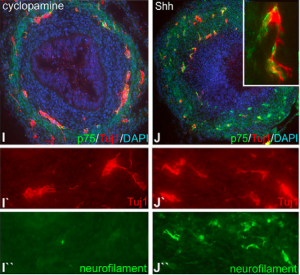 Image: Nagy, Nandor, et al. "Sonic hedgehog controls enteric nervous system development by patterning the extracellular matrix." Development 143.2 (2016): 264-275. How on earth do we turn into a living, breathing, singing, speaking being, from just the fusion of two cells? Development is fascinating and mysterious. Stem cells are one component of how this intricate process unfolds, allowing the embryo to not have every type of cell from the start. Imagine if the only way our bodies could form a brain, a liver, a heart, is if the embryo started out with little batches of each type of cell. Instead, stem cells make it possible to start with just one 'flavour' of cell, and turn that into the many cell types needed to make a fully formed human. In order to take full advantage of stem cells, we need to understand development. What signals are these stem cells sending and receiving to tell them to become brain or liver or heart? In a collaboration between Harvard University and Semmelweis University in Budapest, Nandor Nagy and his team used bird embryos to study the development of a special part of nervous system devoted to controlling our gut. The literal manifestation of the term, ‘gut instinct,’ the so-called enteric nervous system is an extensive network of 'gut-brain' cells wrapped around our gut. To help answer the huge question of how this ‘second brain’ of ours develops, Nagy and his colleagues honed in on the role of one specific molecule, called sonic hedgehog (Shh), which is crucial to development in humans and many other creatures. Specifically, they wanted to look at how Shh influences the cells around the gut to turn into 'gut-brain' cells or not. To visualize the effect of Shh, they took thin slices of the bird embryo’s gut and added fluorescence molecules that showed whether the 'gut-brain' cells were in early or late stages of development. The later stage they were in, the more Shh would be shown to push their development forward. The red fluorescence shows early stage, whereas the green shows late. Adding Shh, in the right column, shows more green fluorescence, but the same amount of red, indicating that Shh pushes the cells into later stages. In the span of just a few hundred words we have narrowed in on the effect of one molecule on one type of cell, and how we can visualize this. This story attests to the power of images in answering big questions, by zooming way in to the level of microscopic cells. Sonnenburg, Justin and Erica Sonnenburg. "Gut feelings- the "Second Brain" in our gastrointestinal systems." Scientific American (2015).